Liberal Religion Gets Loud | Thoughts about Unitarian Universalist worship and music. Thoughts about Unitarian Universalist worship and music. 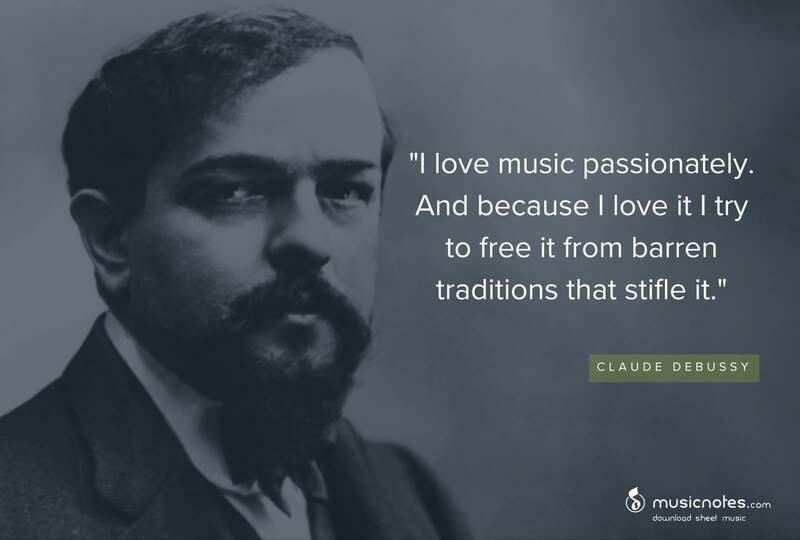 Not saying that UU music is a “barren tradition” (nor was European romanticism, for that matter), but remembering that occasionally every tradition needs a little shaking up to keep things fresh. people these days don’t sing. right? Here are a bunch of young people, clearly having fun, and sounding great. No sheet music, no prior rehearsals, no advance notice of the piece. This happens in a bar in Toronto every week. The people just show up, rehearse and sing! Granted, church is not a bar, but I’m sure some of our congregations would appreciate this sort of energy. What a fantastic experience these happy people are having! We sing in worship because music moves our hearts and minds and bodies in ways that words can’t. It’s not complete without both. These folks (not all young, either!) are clearly having a heightened experience — not worship, but akin to it. I agree, Jed. This could be a perfect complement to worship, or with the right songs, an entire service. It’s going into my idea file for the next music special service. Thanks for sharing it! Answering the “chicken or the egg” question about music and language, here’s an article that will make you sit and think “whoa … really?” Take a few minutes to read it and feel great about having music in your head! Language, music and your brain. 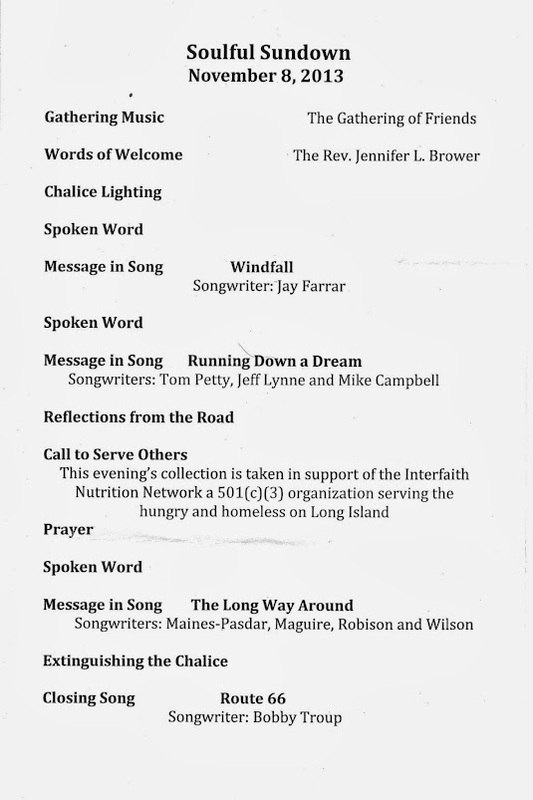 Here’s the order of service from a Soulful Sundown worship I attended a couple of months ago at Shelter Rock Unitarian Universalist Congregation in Long Island, NY. It was part of a full Friday night for UUs, with dinner in the social hall, the Soulful Sundown service, and a coffee house with a visiting singer/songwriter afterwards. They’ve had an up-and-down history. Most of the original ones from the early 2000s didn’t last long. Already in the mid-2000s, when I was looking into the concept for our congregation, Tulsa was the only one remaining. The idea seems to have undergone a revival, however. Searching for “Soulful Sundown” now yields a good number of them around the country, and I think maybe our sense of what’s possible (and maybe what’s appropriate) in UU worship has finally caught up with Rev. Lavanhar’s vision. So, back to the Shelter Rock service: To my mind, this is the essence of what “UU contemporary worship” could be: an expression of our faith and values with no reliance on traditional Protestant liturgy at all. A couple of things jumped out at me: first, the music, of course. Second, there is no “sermon”. Which is not to say that there’s no spiritual message from the minister. The segments labeled “Spoken Word” and “Reflections from the Road” were a combination of readings and a short homily by the minister. It was not a 20-minute dissertation on the topic, though the parts could have been assembled into one. Last, there was no standing up and sitting down, no unison affirmation read from a hymnal, no singing of “Doxology” or “Spirit of Life”. There was nothing that reflected mid-20th century Protestantism (as carried on by typical UU liturgy). The main thing is that this “UU contemporary” service and every one I have participated in (at my church, at GA, at UUMN conferences) appeals not to an age demographic, but a spiritual demographic that reaches across the generations. It’s what you want out of worship, rather than your age, that draws you to this kind of service. “UU young adults” are not automatically attracted to popular music in worship. And “older UUs” are not automatically repelled by it. Some of the younger ones prefer the symphony, and the older ones are members of the pioneering rock-and-roll generation. In my view, Soulful Sundown worship appeals not to an age group, but to a particular approach to one’s spiritual life. Some people prefer more formality in worship, some less. Some people want worship to inspire joy and celebration. Some associate a joyful and energetic worship style with a theology they despise. Some people just don’t like change (maybe that’s where the assumed appeal to the young comes in?). Here’s the downside: these services are still considered “special events”. They’re typically held once a month, often in conjunction with some sort of “coffee house” entertainment afterwards. There’s nothing wrong with that, of course, but why couldn’t this obviously appealing style be a regular thing every Sunday morning? We consider ourselves “religious liberals”. We have broken almost totally with Christian theology. It makes me wonder why most of us still worship like conservative Christians. 1. Well, there was some dancing; maybe that’s not what most of us are used to seeing in worship. 2. Anyone who complains that rock music is “too loud”, while being blissfully blasted by a pipe organ in a small sanctuary is objecting not to volume, but style. 3. I have seen no data to support or contradict this assertion, so you may ignore it as you like. But do ask those “free range” UUs you meet what keeps them away from your congregation and what would make them comfortable there. It seems that WordPress has decided to monetize me by inserting advertisements at the end of each post. Let me repeat: their ad gets the last word when you are reading my posts. Of course, the chances that these will not harm (forget about helping) is about zero. They want $30 a year to return control to me. I understand that they have to pay the bills somehow, but I can’t think of a more intrusive way to do it than sticking an ad for beer or Viagra on the end of an essay about worship music. I am pondering whether to negotiate with the hostage-takers or find another host. I welcome your suggestions, comments or ideas. In the meantime, you can view this or any site ad-free by using Firefox and installing the Adblock Plus extension. Sunday I sang Steve Earle’s “The Devil’s Right Hand”. I like this song because it tells an interesting story and makes its point in a subtle way. The point, as I see it, is that “to a kid with a hammer, everything looks like a nail”. Or, more relevant to current events, “to someone with a pistol, everything looks like a target”. It’s a warning not to let mere possession of technology override your moral judgement. I chose this song before that murder trial in Florida began, but we ended up doing it for a worship service the day after the jury acquitted George Zimmerman of killing an unarmed teenager. Apparently, not much was said from UU pulpits about the situation, but singing Earle’s song the morning after made a powerful comment on the verdict. Sometimes, things just work out that way. Earle’s articulation is terrible, so here are the lyrics, if you’re interested, followed by a video of the song. The format here is laid out just as the hymnal page is. Vertical bars are bar lines, slashes are beats with repeated chords. You are welcome to use this for your services or any other occasion. If you have chords for hymns not in the collection, I’d be pleased to add them.